A Reliable Guide for the SDA Church? As we had before us the emblems of our dying Lord, and were about to commemorate His sufferings, this brother arose and said that he had no faith in what we were about to do; that the Lord’s supper was a continuation of the Passover, and should be partaken of but once a year. These strange differences of opinion rolled a heavy weight upon me. I saw that many errors were being presented as truth. It seemed to me that God was dishonored. Great grief pressed upon my spirits, and I fainted under the burden. Some feared that I was dying. Brethren Bates, Chamberlain, Gurney, Edson, and my husband prayed for me. The Lord heard the prayers of His servants, and I revived. The light of heaven then rested upon me, and I was soon lost to earthly things. My accompanying angel presented before me some of the errors of those present, and also the truth in contrast with their errors. These discordant views, which they claimed were in harmony with the Scriptures, were only according to their opinion of Bible teaching; and I was bidden to tell them that they should yield their errors, and unite upon the truths of the third angel’s message. We can clearly see that Ellen White's "vision" convinced the brethren that it was an error to celebrate the Lord's Supper annually according to the Passover tradition. Annual Celebration of the Lord's Supper an "Error"? Is it an "error" to celebrate the Lord's Supper annually? Did God really guide Ellen White to follow the quarterly Lord's Supper tradition of Protestant churches--the same churches she called "Apostate Protestantism"? Let us examine the Biblical and historical evidence. Just knowing these two simple facts, (1)Lord's Supper replaced Passover, and (2)Passover was celebrated once-a-year, one could logically conclude that the Lord's Supper should be celebrated once-a-year. A third indication of the continuity of Passover in the Christian church is the paschal nature of the Last Supper. The Last Supper was not simply a farewell fellowship meal; it was a special Passover meal during which Jesus instituted a new Passover to commemorate His sacrificial death. 5. Passover sets the historical pattern for the annual observance of the Lord's Supper. 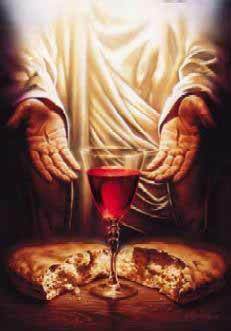 The Lord's Supper is a memorial. Jesus said of the event, "this do in remembrance of me" (Luke 22:19). Memorials are typically celebrated annually. The Passover, a memorial of Israel's deliverance from Egypt, was celebrated annually by the Jews, not quarterly or weekly. National days of remembrance for presidents and other great leaders or war heroes are celebrated annually. There is no Biblical or historical precedent for celebrating a "memorial" quarterly. Quarterly observance of the Lord's Supper is based squarely upon the "traditions of men" (Matt. 15:9). In conclusion, the practice of celebrating the Lord's Supper annually on Passover evening is consistent with Biblical and historical records of the early church. The practice of celebrating the Lord's Supper quarterly rests entirely upon the "traditions of men." This being the case, is it really an "error" to celebrate the Lord's Supper annually on the date of the Passover meal? You decide. 1. Jud Lake, Ellen White Under Fire, p. 258. 3. Ellen White, Life Sketches, p. 111. 4. Seventh-day Adventists Believe..., p. 204, footnote #19. 5. Ellen White, The Great Controversy, pp. 615-616. See also The Great Controversy, p. 382. "Babylon is said to be ‘the mother of harlots.’ By her daughters must be symbolized churches that cling to her doctrines and traditions, and follow her example." 7. Wikipedia, "Quartodecimanism", http://en.wikipedia.org/wiki/Quartodecimanism, Sep. 11, 2011. 8. Eusebius, Ecclesiastical History, 1995, pp. 210-211, cited from "Should Chrisitans Celebrate Passover or Easter", http://www.thejerusalemconnection.us/columns/2010/03/25/should-christians-celebrate-passover-or-easter.html. 9. Wikipedia, "Easter", http://en.wikipedia.org/wiki/Easter, Sep. 11, 2011. 10. Samuele Bacchiocchi, Ph. D., GOD’S FESTIVALS IN SCRIPTURE AND HISTORY VOLUME I: THE SPRING FESTIVALS, chapter 4. 11. Samuele Bacchiocchi, Ph. D., From Sabbath to Sunday, chapter 3, http://www.biblicalperspectives.com/books/sabbath_to_sunday/3.html. 11. Samuele Bacchiocchi, Ph. D., GOD’S FESTIVALS IN SCRIPTURE AND HISTORY VOLUME I: THE SPRING FESTIVALS, chapter 4. Bacchiocchi writes: "A clear indication of the importance of Passover in the religious life of the early Church is the controversy which flared up in the second century over the date for celebrating Passover. ... The two protagonists of the controversy were Bishop Victor of Rome (A. D. 189-199) and Bishop Polycrates of Ephesus. Bishop Victor championed the observance of Passover on the Sunday following the date of the Jewish Passover (Easter-Sunday). He tried to enforce the adoption of this date on the Christian church at large. Bishop Polycrates of Ephesus and the leaders of the Asian churches strongly advocated the traditional Passover date of Nisan 14, transmitted to them by the Apostles Philip and John. They refused to be frightened into submission by the threats of Victor of Rome and eventually were excommunicated by the Roman bishop. Our study suggests that two significant factors contributed to the abandonment of the Biblical Passover date of Nisan 14 and to the adoption of Easter-Sunday, namely, anti-Judaism and paganism. Anti-Judaism influenced the abandonment of the traditional date of Passover (Nisan 14) in order for Christians to distance themselves from the Jews. Paganism influenced the adoption of pagan cosmic speculations and myths to make Easter-Sunday attractive to Christians coming from a pagan background."